Nichole A. Baumgart is an educator at Bing Nursery School at Stanford University and a professor at Pacific Oaks College. She is a consultant in the early childhood field and is a mentor for student teachers in their practice. She has over 14 years of experience educating children in early intervention, transitional kindergarten, and in multiple laboratory and early childhood classroom settings across the nation. Working in California’s Silicon Valley has inspired Nichole to investigate infants and toddlers STEAM concept explorations. Nichole has presented on the topic of STEAM concept learning in infant and toddler classrooms to the early childhood profession in a variety of settings including California’s Association Education for Young Children (CAEYC). Her current interests are centered on the intersection of technology and early childhood, STEAM concept learning, and design thinking in the early childhood field. STEAM’s goal is to support the native creativity and innovation that all young children possess. Infants and toddlers have a naturally curious mindset. Yet there is little literature for educators about how to use STEAM concepts in their practice with infants and toddlers. 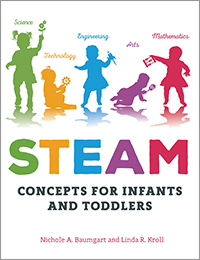 This book uses illustrated vignettes to narrate stories of infant and toddler STEAM concept explorations and bring out new possibilities for caregivers to uncover within their own environments.